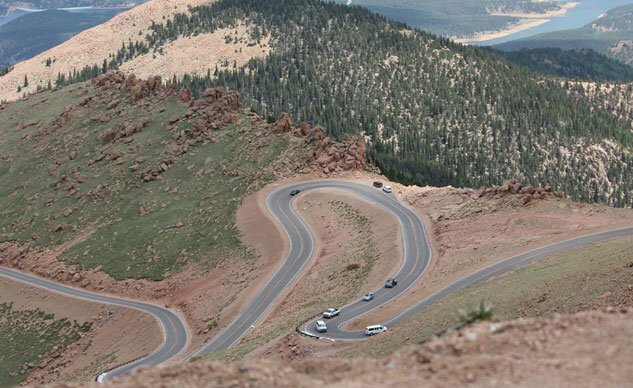 Spanning 12.42 miles in length, with 156 turns and a climb of 5000 feet to the 14,100-foot summit, the Pikes Peak International Hill Climb is one of the most spectacular and dangerous motor races in the world. Runoff is nonexistent, the cliff drops straight down, and the only objects to break your fall are trees or jagged rocks. Racers have been tackling the mountain since 1916, and while some have met their demise on the mountain, far more have successfully crossed the finish line, with many famous names listed among the winners. This year, I was lucky enough to receive an invite to race the mountain during the 91st running of the infamous hill climb, in what would turn out to be a historic event. If you’ve been following Motorcycle.com on Facebook or Twitter, or read my blogs on the site (find them here, here and here), then you’ll already have an idea how the week turned out. But there’s much more to be said. My path to Pikes Peak was very unusual and last minute. Harlan Flagg, owner of Hollywood Electrics, the largest Zero dealer in the country, wanted to enter a couple bikes in the race, but race officials didn’t know in which class to group them. Instead, they told Flagg to come back with at least six bikes of his own and a new class would be created. A daunting task, but Flagg saw the potential for history to be made. 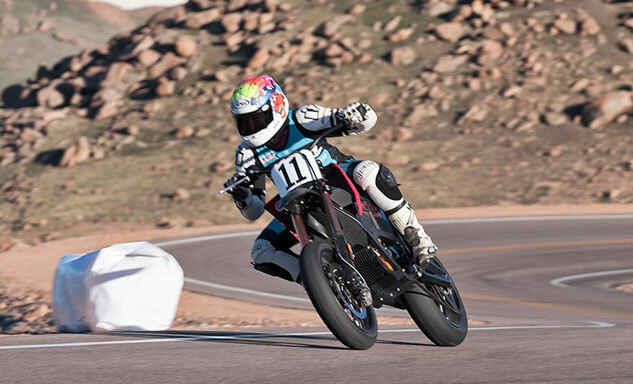 He sought out Brandon Nozaki Miller, Ted Rich and Jeremiah Johnson to ride 2013 Zero S models, while Jeff Clark, Nathan Barker and Aaron Frank from Motorcyclist Magazine, would pilot 2013 Zero FXs. 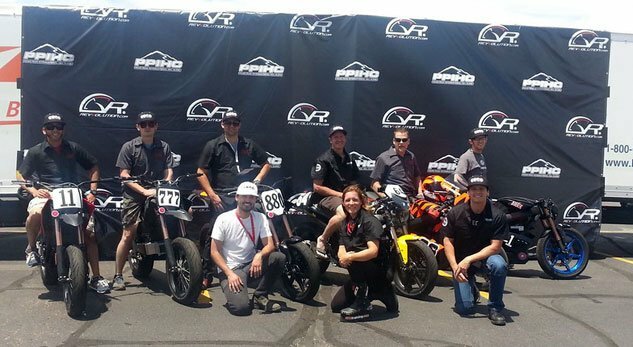 Together, they would form the Exhibition Powersports-Z class, the first ever production electric motorcycle class at Pikes Peak. 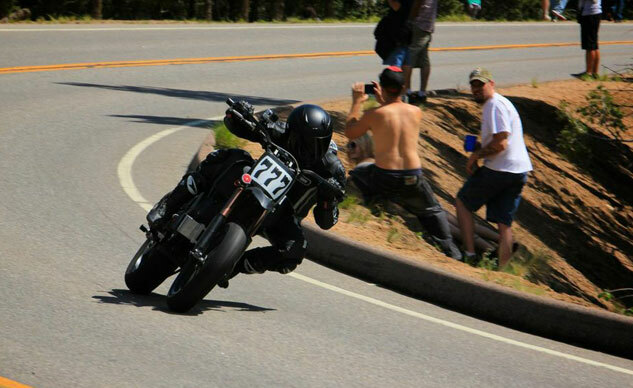 Harlan Flagg put together this band of characters for Zero Motorcycles’ and Hollywood Electrics’ pursuit of Pikes Peak. From left to right: myself (11), Jeff Clark (777), Nathan Barker (880), Harlan Flagg, Jeremiah Johnson (64), Elaine Carpenter, Ted Rich (26), TJ Aguirre and Brandon Nozaki Miller (111). Last minute scheduling complications meant Frank had to withdraw from the event, at which point he tipped me to take his place — proof that, despite working for competing titles, moto-journos look out for one another. Obviously, a bucket list item like this was one I couldn’t pass up. I immediately agreed, packed my leathers and booked the first flight to Colorado. What follows is a first-hand account of my crazy week. When Zebulon Pike discovered the peak which now bears his name in 1806, he boldly proclaimed it would never be ascended by man. Clearly, he underestimated the willpower and determination of his fellow species. If Zebulon were alive today, 207 years later, surely he’d be astounded to find that not only has the daunting peak been ascended, but it’s been downright conquered. This view is just a tiny sliver of the course. Here, you’re looking down at Glen Cove (the green building), which marks the start of the middle section. The course was fully paved in 2012 and still operates as a public road even during race week. It’s closed off from 2am to 8:30am for race practice starting at 5am, meaning the teams and riders need to wake up at an ungodly hour to be on the mountain by 3am every morning. Raceday is the only day the road is closed entirely. 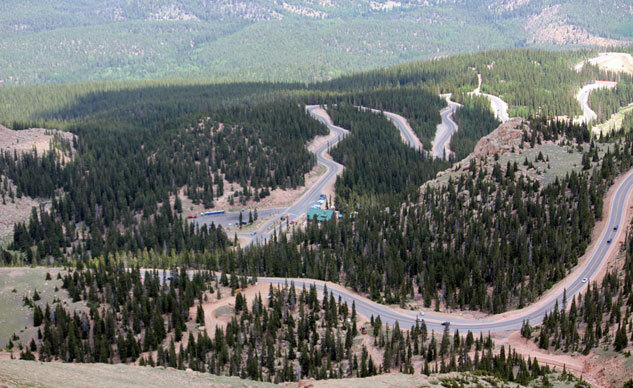 The 12.42-mile climb is split into three sections (top, middle, bottom) during the week, with motorcycles practicing in one section while the cars split into two groups for the remaining sections. The only meaningful time, however, comes Friday during qualifying on the bottom section, which motorcycle competitors see the least of, as we’re relegated to the middle and top sections earlier in the week. At the higher altitudes, above the treeline, jagged rocks replace the evergreens. This year there were 83 motorcycle entries (including quads, sidecars and side-by-sides), 20 more than our four-wheeled counterparts, with both sides having major storylines to follow. On the car side, nine-time World Rally champion Sebastien Loeb was the main attraction getter. 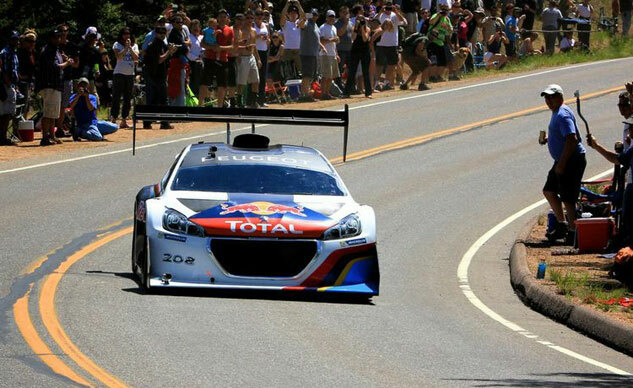 The Pikes Peak rookie, driving a Peugeot 208 T16, was touted all week as the first man to possibly break the nine-minute barrier, astounding considering only a handful of people have broken 10 minutes. And he did just that, obliterating the outright course record of 9:46.164 with a 8:13.878 — a time many feel won’t be broken in the foreseeable future. Yes, this is Motorcycle.com, but Sebastien Loeb’s performance in his Peugeot 208 T16 — prepared specifically for Pikes Peak — will be talked about for a long time. Only a handful of people have gone under 10 minutes — he almost went under eight. 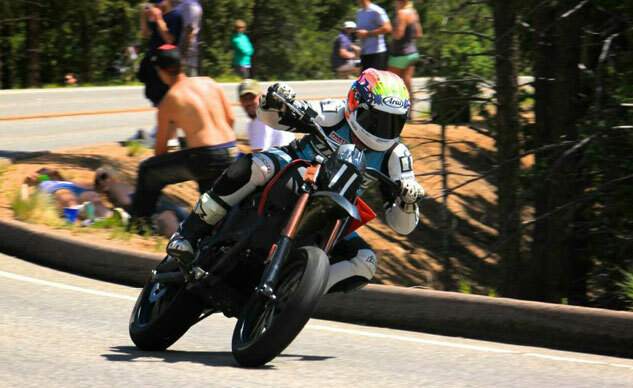 On the bike side, there was big news from the Lightning camp, as current record holder Carlin Dunne was back to defend his title — and possibly break his own class record of 9:52.819 — aboard the Lightning e-superbike. The same one I rode in this review last year. In the end, Dunne was still the fastest motorcycle up the mountain, crossing the line in 10:00.694, but was still almost eight seconds slower than his record set last year on a Ducati Multistrada. He cited grip issues as the culprit for his slower time. Not surprising, as the frigid winter drastically deteriorated road conditions near the top. 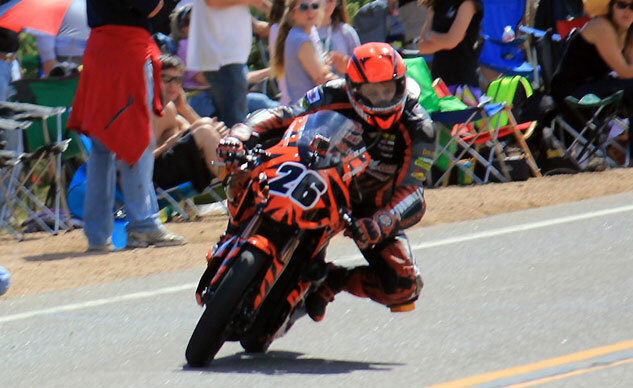 Carlin Dunne traded gasoline for electricity, riding the Lightning e-superbike in an attempt to break his own motorcycle lap record. 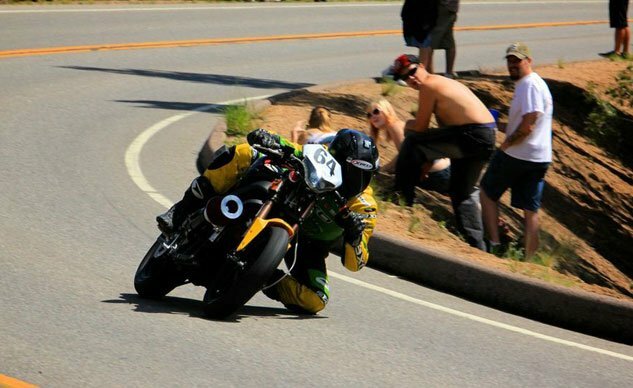 He didn’t, but he still was the fastest guy up the mountain on two wheels this year. 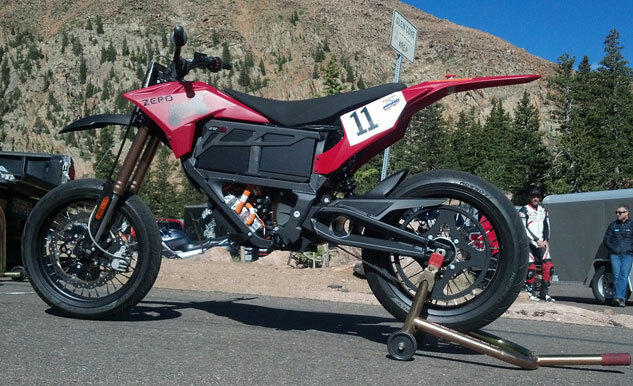 My steed for Pikes Peak was a 2013 Zero FX, running both of the quick-change batteries to produce 5.7 kWh. But this was no ordinary FX. Flagg modifications include ditching the stock FX motor for the bigger version in the S unit, adding 10 horses at the expense of two ft-lb of torque, equaling 54 and 68, respectively — same as the S bikes. Stock, the FX is geared to loft massive wheelies at the twist of the right wrist. Speed was more important on the mountain, so the “Electromotard” was geared tall to reach speeds tickling 100 mph. Lights, mirrors, onboard charger and the rest of the street stuff were removed to save weight, while custom 17-inch supermoto wire wheels with Excel hubs were made specifically for this FX. A larger front brake rotor was installed, along with a matching caliper and adapter bracket designed and built by Jeff Clark. Tires were Pirelli Diablo Rosso IIs in 110/70-17 front and 140/70-17 rear sizes. The Zero’s suspension remained stock. This isn’t your ordinary 2013 Zero FX. The best part is, 95% of the bits on this bike are available directly from Zero. A mandatory battery kill switch was installed on the tail, as was a compulsory siren to warn spectators against crossing the road (it happens frequently) because they can’t hear a vehicle coming. 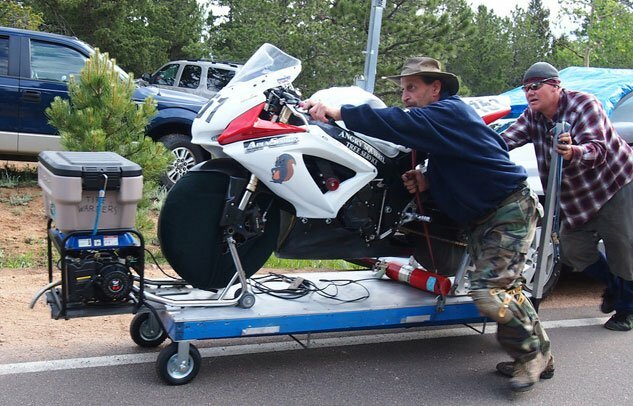 All told, the bike weighed approximately 264 pounds, one hundred pounds less than the S models Johnson, Rich and Miller were riding, while making the same power. 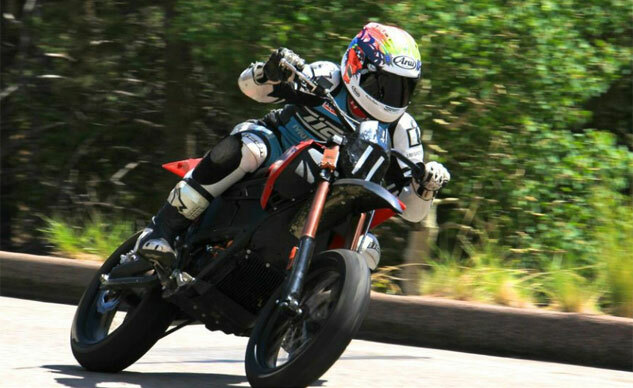 Electric motorcycles have an advantage over their gas counterparts at high elevation, as power output isn’t affected by the thinner air. To make sure I’d also be ready for the thin air, I hit the gym on a regular basis. 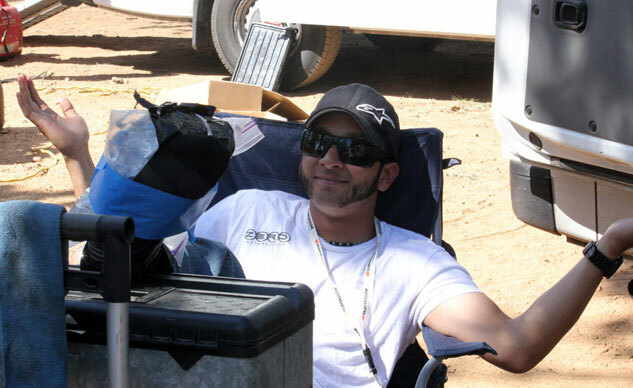 Managing battery capacity and keeping the motor controller cool were two major concerns weighing heavily on Flagg’s mind leading up to the race. Ideally, all six bikes would reach the summit with zero battery left and the motor controllers just shy of hitting thermal cutback at 110 degrees Celsius. The display screens on the Zero Motorcycles app provide a wealth of information, while allowing the rider to make changes to the bike’s performance at the push of a button. We knew it wouldn’t be possible to ride the bikes at full power, as doing so would drain the batteries and cause the motor to hit thermal cutback within minutes. The solution was to ride in Eco mode, the power-saving riding mode, and turn off regenerative braking to let the motor cool momentarily while braking. The neat thing about the 2013 Zeros is the ability to control a number of the bike’s parameters in Eco mode via Bluetooth by simply downloading an app on your Android or iPhone and pressing a few buttons. The ones we’d be concerned with for the race were max torque and max speed. Running similar speeds and being on similarly prepared FXs, Clark and I teamed up and experimented with different max torque and max speed outputs throughout practice. Back at the hotel, we’d download each bike’s data logs to chart the motor’s maximum temperature and how much power we used during our practice runs. The goal after completing all three sections would be to find an optimum setting to get us to the top without overheating the motor and with zero battery to spare. It’s easy to think running in Eco mode meant crawling up the mountain, embarrassing ourselves along the way, but this couldn’t be further from the truth. After Wednesday’s practice in the tight middle section of the course, Johnson, Clark and myself posted times quicker than roughly half the field. 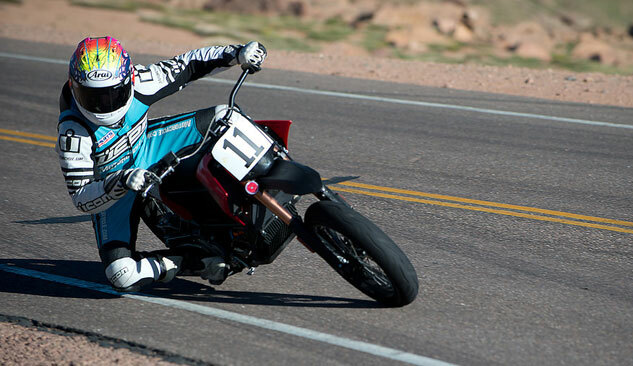 This trend continued the following day in the fast and flowing top section of the course, where despite having a 100-mph top speed, Clark and I teamed up again and passed gas bikes ranging from 250 supermotos to middleweight sportbikes. And again, our times were midpack overall. By now we were turning heads, as our fellow competitors started mingling in our pits, asking us questions. Friday’s practice day held a little extra meaning, as times from today’s bottom section would be used as qualifying for the race. Nerves were higher than normal, as only Johnson had run practice laps on this section before. So not only did the rest of us have to learn a new section, but we had to post a quick time, too. Again, Clark and I rode together to collect data and compare notes on preferred lines. On our very first practice session, however, I caught Clark and attempted an outside pass at a turn nicknamed “The Sump.” This double apex right-hander is tricky, with its open initial radius that tightens quickly at the end. With way too much entry speed and my trajectory going a different direction than the road, I tucked the front. Knowing the edge of the road was near and a 15-foot drop awaited, I clawed at the road with my hands to try and scrub as much speed as possible. Suddenly, the feeling of friction between my leathers and asphalt was replaced with a moment of quiet nothingness as I had flown off the road. Three of the six Zeros crashed over the course of the week, with only minimal damage to all of them. Here, Flagg and TJ Aguirre sacrifice the front end of another FX to replace the one I bent after flying off the road. The landing came quickly and was softer than I expected, though once I stood up an immediate pain came shooting from my right foot. I later discovered I had fractured a bone. A flood of emotions came over me, but none bigger than feeling I had thrown away my shot at winning. Amazingly, the FX was still operational when I found it lying beside me (this drop would have been lights out on a gas bike), though its fork was severely bent. Despite not being able to walk, I was still able to ride the bike back to the pits where Flagg and TJ Aguirre, Zero’s Media Relations Coordinator and our mechanic for the week, swapped front ends with a spare FX. I then hobbled back on the bike and made one run just to set a qualifying time and fulfill a rookie requirement stating all rookies must complete at least one run of all three sections. Stupid hurts, hence the ice pack strapped to my foot with both painters and duct tape. But it wasn’t going to stop me from racing on Sunday. Meanwhile, Johnson qualified fastest of the six Zero riders, with a blistering time of 5:00.720, almost 10 seconds faster than Clark (5:10.420) in second. Johnson later admitted he had his bike set on Sport mode and full power during his run. Rich (5:21.423), Barker (5:46.844), myself (5:53.716) and Miller (6:00.689) made up the rest of the field. 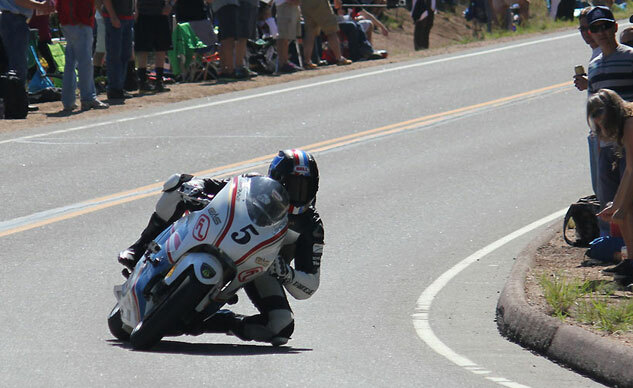 Raceday at Pikes Peak is unlike any race I’ve ever been to. Fans camp out at the base of the mountain the night before so they can be the first to reach the prime viewing locations when the gates open at 5am. There’s a buzz in the air as there are cameras and media everywhere, including the sky, as multiple helicopters hover above to broadcast the race online. After studying the data from practice, Flagg, Clark and I calculated my optimum setting would be allowing maximum top speed while limiting my max torque to 80%, all done through the phone app. This setting would give a 15% cushion in battery power in case I felt the need to switch to Sport mode near the top. After numerous delays, the official finally gave the green flag to start my run — an hour behind schedule. As it was, we were already gambling that, if it were to occur, thermal cutback would happen towards the end of my run, though battery capacity wasn’t an issue. The other riders mounted phones on their bikes so they could monitor their status during the race through the app and adjust their riding on the fly. Not wanting to potentially damage my phone in another fall, I opted against this, so Flagg plugged in his computer to raise the thermal limit of my motor while also lowering my torque curve, essentially lengthening the time it would take the motor to reach full available torque – another measure to limit heat buildup since I wouldn’t be able to monitor it in real time. 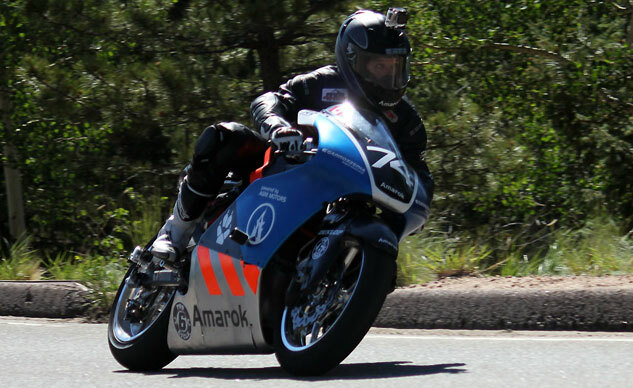 Amarok motorcycles was another e-bike competitor, scraping together enough funds to make it to Colorado in their Volkswagen van. Rider Michael Leon unfortunately wasn’t able to finish the race. His first run was aborted after a red flag for crashes in front of him. He was then forced to restart the race, and without a full charge Leon ran out of battery just five turns from the end. With my chances of winning down the drain after my crash and subsequent foot injury, coming in third behind Johnson and Clark was the best I could hope for. 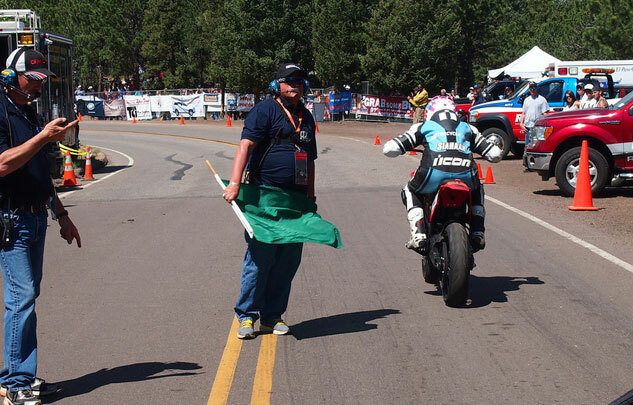 But I wasn’t going to know how much, if any, pain I’d experience once the green flag dropped and I was off. The first motorcycle, Micky Dymond on a Ducati Multistrada, left the line at 8:15am, with the rest scheduled to leave in 20-second intervals. 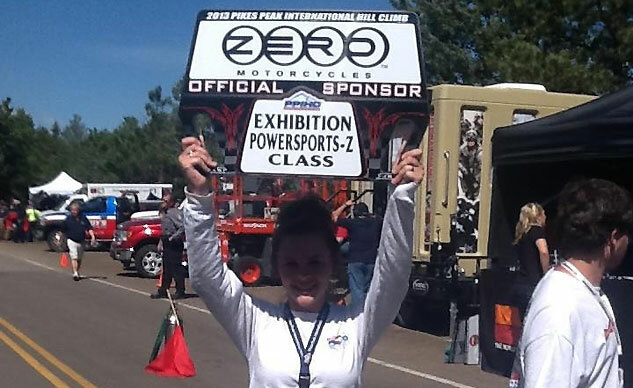 Numerous crashes and mechanical failures postponed the schedule, resulting in the Exhibition Powersports-Z class, my class, not starting until after 10am — the time officials were hoping all motorcycles would be finished. There were many clever ideas on how to keep bikes on tire warmers while staging before the race start. Jeremiah Johnson launched first, with Clark ready to catch him 20 seconds later. Barring any unforeseen mishaps, Ted Rich, with his 40-second head start on me, would be the only thing in the way of reaching my third place goal. My strategy was simple: stay upright, pass Nathan Barker, and get close enough to see Ted Rich in front of me. It’s a race against the clock after all, so being able to see Rich would mean I’ve more than made up the 40-second gap. I was admittedly nervous, as falling again wasn’t an option, and I had very limited knowledge of the bottom section of the course. Youtube videos help, but there’s nothing like actually running the course for yourself, which I only did once. When the green flag dropped, I rode hard, but left plenty in reserve through the bottom section, saving my energy for the middle and top sections. Jeremiah Johnson was the first in our class to make his run after his fast lap in qualifying. It was surreal being alone on the road, with all the fans cheering me on — I could actually hear them chanting in the slower sections of the course. This was like the ultimate canyon ride except there weren’t cars coming from the other direction. The FX felt quick, but the front end felt tight and didn’t inspire confidence — likely the result of over tightening the steering stem bolt. Regardless, there was nothing I could do about it now, and I managed to make up the 20-second gap to Barker. I passed him a few turns away from Glen Cove, which marks the middle section of the course — my strongest. My foot wasn’t allowing me to ride normally, but I felt I had to push in this section if I were to catch Rich. After clearing the tight “W’s” section, the course opens up, and it was here I could see a small glimpse of Rich far ahead of me. Jeff Clark was the second rider to make his run. He and Jeremiah Johnson were considered favorites to win the class. A rough 40-count in my head meant he was still ahead of me on time, so I pressed on; red mist in my eyes, foot concerns out the window. After passing Devil’s Playground, the start of the top and final section of the course, I again caught a glimpse of Rich. This time the 40-count worked in my favor. I pushed on from here to solidify my position, even switching to Sport mode near the top for full power, but the vagueness I was feeling in the front end, especially in some of the fast sweepers, was enough to convince me to simply follow Rich home to the checkered flag, 12 minutes and 24 seconds after I started; the fastest 12 minutes of my life. Ted Rich, aboard a Zero S, was the only thing standing between me and my third-place goal. Crashes earlier in the week lowered his confidence and desire to push. As I hoped, I did clinch third place. But more spectacular were the performances of Jeff Clark and Jeremiah Johnson. Clark managed to win the race, clocking a 12-flat (better than half the field), with Johnson only five seconds behind. Both stated they hit massive thermal cutback a few turns before the finish line, while I didn’t notice any. More importantly, all six of the Zero riders made it to the top safely with plenty of battery life left in reserve. Unfortunately, because of all the delays, the motorcycle competitors were forced to stay on top of the mountain so the cars could complete their race. A whopping seven hours later, after numerous incidents and weather stoppages, the last vehicle finally crossed the line and we were allowed back down. After seven wasted hours at the top of the mountain, patience was thin, stomachs were empty and flights home (including mine) were missed. 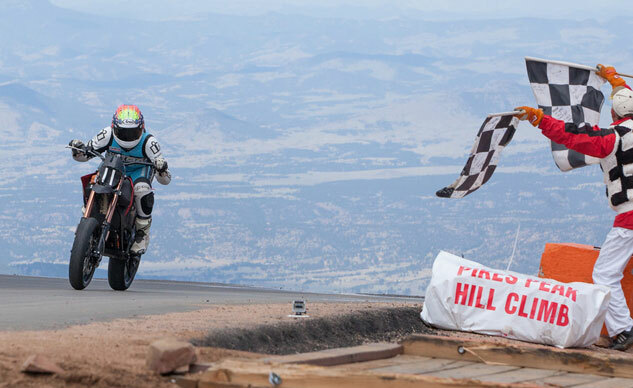 The long wait almost diminished the accomplishments of the day, as a new outright record was set, eight out of 10 motorcycle records were broken, Carlin Dunne beat out all motorcycles on electric, and the entire Zero squad made it safely up the mountain and into the history books. It’s not every day I get asked for an autograph. Maybe it was the crutches. 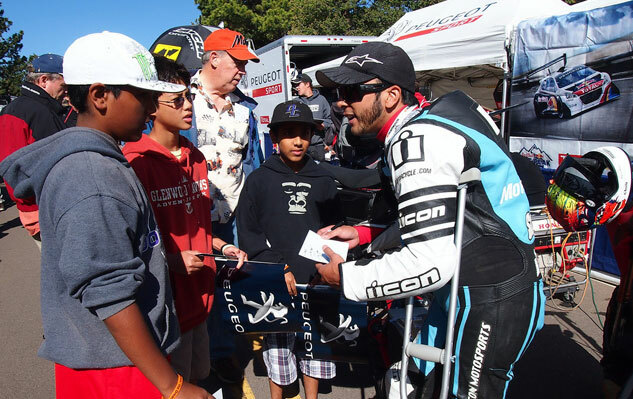 The level of fan interaction at Pikes Peak makes the race extra memorable. However, the magnitude of the occasion came into focus after seeing the tremendous support from the fans on our way back down the mountain. More than 12 hours after securing their post for the race — enduring heat, followed by rain and even hail in some areas, there they were lining the course, cheering, clapping and giving high fives to anyone within reach. Their dedication and support was amazing and unlike any race event I’ve been to before. Harlan Flagg’s dream coming to life. With Lightning and Dunne beating all motorcycles and the six Zeros making it to the top faster than quite a few gas bikes, we earned the respect of our fellow competitors. Exactly what Flagg set out to do.